Editor’s Note: Every year I try to cover the Annapolis Cup because I love the 9 wicket game, partly because I spent many happy days in Annapolis and the surrounding Chesapeake Bay and partly because this croquet match is followed and watched by more fans than any other croquet event in the world. It has been going on for over thirty years, is has the most news coverage of any croquet event in the USA, draws more fans than any other croquet match and , in my opinion, has some of the best up and coming young talent in our country. MR: Does St. Johns formally challenge Navy each year? MR: I believe the game is four ball team play and not six ball or cutthroat, correct? Hardison: Correct. Blue and black versus red and yellow. MR: How many players on each team? Is it fixed? Hardison: The Cup is doubles. Best of five. But we play ALL five. No matter the score. So there are always at least ten players per side who play a full match. Lately, an exhibition match has begun on court three. And while that match is unofficial it gives some younger players a chance to gain experience. MR: How many courts are set up? Full size? Three courts are set up on front campus. Court 1 is the Wicket’s court and typically the Imperial Wickets from both teams play with their partners on that court. Court 1 and 2 run parallel to one another and perpendicular to College Avenue. Court 3 runs parallel to College Avenue. It is also usually a bit more shady on Court 3, and there is an ever so slight slope to that court. Court 3 is generally recognized as the “party” court. It is the furthest away from the swing dancing and the band, but the closest to all the tents. A very picnic like atmosphere whereas Court 1 and 2 have a more tournament like atmosphere. By the way, the lawn is cut close on match day, but there is still some randomness in it (we actually like how the mechanics of croquet runs headlong into the unpredictability of Nature on front campus). MR: How is the Cup challenge run? Hardison: We start three games at once. The next two official matches start after the first two conclude (usually on Courts 1 and 2, but not always). MR: About the equipment, wickets, Deadness Boards and balls. Do they use 13 oz balls? 4 1/2 inch wicket gap? Hardison: I believe the wickets are 4 inches wide and about 7/16” in diameter. Sixteen oz. balls are used now. I believe the CQ-16 is the model they use. This is actually an evolution. When the match first started, truly backyard sets were used. By the late 80s / early 90s, we graduated to those old Forster sets with the wooden balls, which ran more smoothly than any given ball on the imperfections of our lawn. Of course the draw back was: they were wooden. One of my fondest memories is hitting a cross court shot to take my opponent off set, and both balls exploding on contact! Though delightful to watch, this did prove problematic. By the time I started playing, we got the team to invest in what used to be called “class B” balls. They were plastic, single milled. They ran a little more smoothly on our lawn than double milled, and they had the benefit of not exploding. We were using light weighted Jacques mallets back then. The transition to full 16 oz. balls and class A mallets began once we started going to Nationals and playing on nice lawns. MR: Do all the players get to play during the Tournament? Who sets the players per game? Can a player substitute during a game? Hardison: Yes. We have had subs when someone gets hurt and can no longer play. This is exceptionally rare. The Imperial Wickets from each team work these things out. Navy’s Imperial Wicket is elected by the team. St. Johns’ Imperial Wicket is chosen by divine right of the wicket retiring. The Imperial Wicket of St. John’s College Croquet is the last pure form of tyranny left in Western Civilization. MR: The tournament is the best of five games. Is there a time limit? Is there an end sequence, or sudden death? Hardison: No time limits. No shot clocks. We play until both balls in a pair have hit the second stake. This is a point of pride for both teams. If someone appears to be slowing progress to gain an advantage, they are gently encouraged to move along, which is all that is necessary when both teams respect one another. MR: Have tournaments been blowouts? 3-0, how many? 3-1? This year it was close 2-2 until game five. Hardison: Yes. From time to time this happens. But only 4-1. I have personally never seen a 5-0. In fact, I would be surprised if that occurred, something about it strikes me as unseemly. Currently, the teams are much more evenly matched than ever. The last three years have all been 3-2. And the rubber match has been a nail biter coming down to the last shots. So the Cup is more competitive than it has ever been. It is likely to stay that way for awhile. 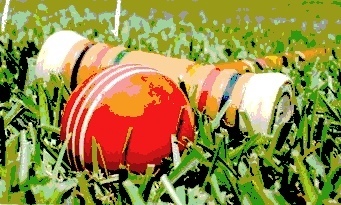 This is good for 9-wicket croquet. MR: What were the scores for each game? Hardison: We don’t really “keep score” in terms of wickets. Whichever team gets through the course and stakes both balls out first is the winner. Everybody knows one or two good turns can change the game completely, so we focus less on how many wickets ahead or behind one is, and more on how best to close out the match in one or two big turns. MR: What Challenging Options are used? I see boundary lines and a deadness board in the pictures. Hardison: The Annapolis Cup rules are handed down from Imperial Wicket to the Wicket in Waiting informally. Since the 90’s we have followed essentially all American 6 wicket standard rules with a few exceptions given the 9 wicket format. Other than that, deadness and liveness run identical to American six wicket. You may not “foot” the ball (placing your foot on top of your ball during the croquet shot) and you must move the ball you just roqueted on your shot, if only a quiver. Crush shots are illegal, however they are rarely called – if you can make the wicket we typically don’t care how you did it. Rover rules are similar to 6 wicket but going rover in 9 happens a lot more. After turn one if you have not advanced past first wicket you are three ball live. We made this standard to the Cup to allow for more sophisticated openings. An unofficial Johnnie 9-Wicket rulebook is being edited currently and should be done by the fall of this year. MR: Do the schools play each other at other events? Hardison: Navy normally attends the Collegiate 6 Wicket and Golf Croquet events in the spring. So do we. Other than that we just practice against each other in prep for the Cup on our front lawn. MR: This year there is a video showing a St. Johns female player staking out Blue-Black to apparently win the Tournament 2016. Who is she? She is a junior and will be returning. She ran a three ball break towards the end of that match to pass Navy and ultimately end the match. That put SJC over the top at 3-2. I believe she placed second at USCA Collegiate Nationals this past weekend at Merion. Another team headed by Noe Jimenez (Imperial Wicket) and his partner, Shane Hetler (the Wicket in Waiting), placed first (SJC’s 14th American 6-wicket national championship). MR: Are there “classic” openings that the Johnnie’s have developed over the years? Hardison: Yes. And actually this too is a story in and of itself. If you look at the Annapolis Cup record, there were 9 straight victories by the Johnnies in the 90’s (the longest streak, so far). I was fortunate to learn the game then from the best teacher I’ve ever seen: Jim Knerr, Class of ’96. He taught the tandem John Andrews and Kit Linton (who were co-Imperial Wickets the year I was Wicket-in-Waiting), and they were the best duo I have ever seen on a croquet court. During this era, we developed a type of inner-school rivalry between all the best players. It was inevitable that the next class would “outdo” the class ahead of them, but not without earning their stripes. So moves were developed, strategy refined, equipment experimented with, etc., all in an effort to be the best, and to play the best. Standard opening moves predominated like, blue’s gambit; the stalking horse; etc. But overall, the style of play that developed during this timeframe was ruthlessly defensive. Tempers were known to flare during these games because of this aggressive style. 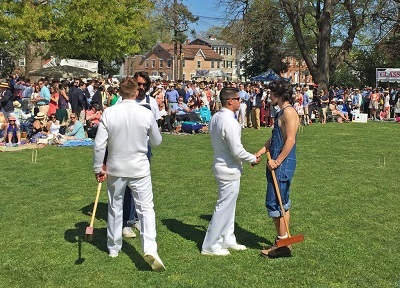 About three years ago, the St. John’s croquet team lost to Navy for the second time in a row (only time this has happened). Many of us from the 90’s were there. We noticed that the game the team was playing was not what we had developed. To us, it seemed like the lessons and strategies we all helped in refining over the years, were in danger of being lost forever. 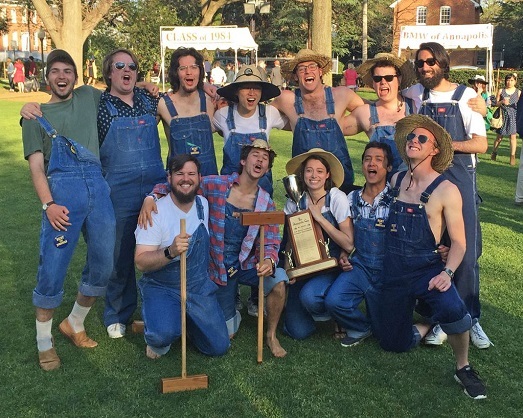 We set out to change that with a group of croquet-alums calling themselves the Rusty Wickets. We played with the team for two days, teaching them our old strategy, and helping preserve the style that was developed in the 90s. MR: What other events do you have planned? Hardison: We have an open 9 wicket tourney in the fall during our homecoming (Sept. 23-25, 2016). It is called the Banned in Boston Open . We like to think that the style of our play was similar to the type that caused croquet to be banned in Boston in the late 1800s. I will be the Director for the tourney this year, and guest players are invited (though space is limited). Our first team to compete in Nationals (‘96) will be celebrating its 20th reunion at this event. The Imperial Wicket from that year as well as many of those players will be returning. Great stories will be told, and excellent 9-wicket will be played. Details on the tournament may be found @RustyWickets on Twitter and we expect registration to open in June of this year.